‘But that’s just not true,’ I insisted. ‘There’s an infinite supply for anyone with an imagination’. This month is Reading Ireland Month. I wasn’t sure whether I’d have time to join in, but then I remembered I had A Ladder to the Sky on the TBR pile and, of course, John Boyne is an Irish author. I have read and enjoyed several of his books and this – his most recent, published in 2018 – sounded as though it would be another good one. John Boyne’s books are always imaginative and always a little bit different to anything else I’ve read and this one is no exception. 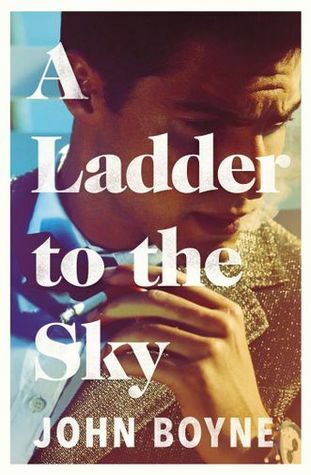 It tells the story of Maurice Swift, an aspiring novelist whose ambition knows no bounds and who is prepared to do whatever it takes to climb the ‘ladder to the sky’. The first section of the book, however, is written from the perspective of Erich Ackermann, a successful author who is touring Europe to promote his latest novel. Erich, a gay man in his sixties, has almost given up on the idea of finding love, but when he meets Maurice at a hotel in West Berlin in 1988, he feels an instant attraction to the young man and offers him a job as his assistant. Soon he finds himself confiding in Maurice, telling him all the secrets of his past and his youth growing up in Nazi Germany. But can Maurice be trusted – and what might he do with the information he has been given? While I was reading this opening section, I was beginning to feel confused. It wasn’t really what I’d expected from the blurb – it seemed as though Erich Ackermann was the protagonist of the novel rather than Maurice and instead of reading a story about an ambitious young author I was reading one about Nazis and the fate of a family of Jews during the war. Eventually, though, I understood the point of all this and saw where the plot was heading. As one of the characters in the novel remarks, sometimes you need to give a book at least one hundred pages before making up your mind (“Yes, perhaps you’ll be bored at the start, but what if it gets better and suddenly everything that went before falls into place”) and that was certainly the case here. The book became more and more enjoyable the more I read, and by the time I reached the end I could appreciate the clever structure and the way in which Maurice’s true nature was revealed. I won’t go into too many details about the things Maurice does as he tries to climb the ladder of ambition, but I can tell you that he is not a pleasant person at all. He is ruthless, cruel, completely without morals and doesn’t seem to care how much he hurts and betrays people. As an author, he suffers from a problem which will be familiar to many aspiring writers – he knows he can write, but he doesn’t know what to write about. Unable to think of any stories of his own, he decides to steal other people’s. But these are not just simple cases of plagiarism; the methods Maurice uses to obtain these stories and pass them off as his own are much worse than anyone could imagine. Although the novel is quite dark at times (the section narrated by Maurice’s wife, Edith, is particularly disturbing) there’s also some humour, especially when Boyne is having fun satirising the literary world and various author stereotypes – for example, we meet Henry Etta James who writes an award-winning novel called I Am Dissatisfied with My Boyfriend, My Body and My Career and Garrett Colby whose books all feature talking animals, including one about an ‘unrequited love affair between a man and a raccoon’. At one point Maurice also picks up a book by Maude Avery, the fictitious author from Boyne’s previous novel, The Heart’s Invisible Furies, which I thought was a nice touch. Real authors find their way into the novel too, such as Gore Vidal, whom Maurice visits at his villa on the Amalfi Coast. I ended up loving this book; in fact, with the exception of The Thief of Time, I’ve enjoyed everything I’ve read by John Boyne so far. I still have four of his earlier adult novels to read: The Congress of Rough Riders, Next of Kin, Mutiny on the Bounty and The House of Special Purpose. If anyone has read one or more of those, I’d love to know which you’d recommend I read next. Interesting, but not quite my cup of tea. I think I’ll return to the other Irish novelist you reviewed recently. I’ve loved most of John Boyne’s books but I can see why they wouldn’t be everyone’s cup of tea. So glad you enjoyed this – I enjoyed it very much, so entertaining. What I love about your reviews is that I get (finally) what a book is actually about. Not a blurb, not a cover flap summary, but the real deal. Nothing I had seen before made me want to read this novel but your review did! I never know what to think about Boyne. I have read several of his novels. All of them are different from the others. Some I thought were fairly mediocre and others I liked a bit. I never know what to expect. However, I don’t really understand why he’s so highly thought of. I often wonder why people think so highly of certain authors, but all tastes are different I suppose! I do usually enjoy John Boyne’s books but I agree that they vary in quality. That’s certainly true that tastes are different. Great review Helen. I bought this on Saturday at someone’s recommendation so really looking forward to reading it soon. I really want to read more John Boyne I have only read The Boy on the Striped pyjamas. My sister is a fan and has recommended a couple of his books. This one sounds very interesting. I haven’t read The Boy in the Striped Pyjamas yet but I probably will eventually. I would definitely recommend trying his more recent books as I think they are getting better and better. That is good advice from the character! Yes, good advice, although I don’t always follow it. I’m glad I did with this book!